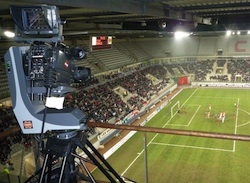 French developer Hybrid has unveiled Sport Track, billed as an innovative technology that enables robotic cameras to automatically follow live game action by sending positional tracking data from a manned master camera to an unmanned slave. After considerable trial and error, Hybrid discovered the answer. A manned Cartoni motion tracking pan/tilt/zoom/focus (PTZF) camera serves as the master camera, which is networked to a Hybrid Titanium robotic camera head. Using the newly developed software and drivers from Hybrid, all of the camera data—including position, angle, distance, and speed—is optically tracked, encoded and transmitted by the Cartoni camera over to the Titanium robotic camera head. These coordinates “tell” the Titanium (robotic slave) camera head how and where to move to follow the game action precisely. Hybrid is a leading manufacturer of broadcast production technologies. The company’s mission is to develop solutions and products that allow the digital media market to produce value-added content within an integrated workflow. Our product range includes virtual studio and augmented reality solutions and broadcast robotic camera supports. Hybrid consistently develops new products and solutions that push the limits of content creation while providing a clear rationalization of costs. Further information is available at www.hybridtv.tv.